The Graphic VCO allows you to draw your own waveforms, arrange them in wavetables and wavetable banks, morph between two selected waves and alter the resulting wave in advanced ways (FXes) – apply FM, phase distortion, ring modulation, wavefold/wavewrap, bitcrush. Waves, wavetables, FXes and other settings can be saved and recalled from the memory instantly. The module has two outputs – the main output and the output with configurable suboscillator. 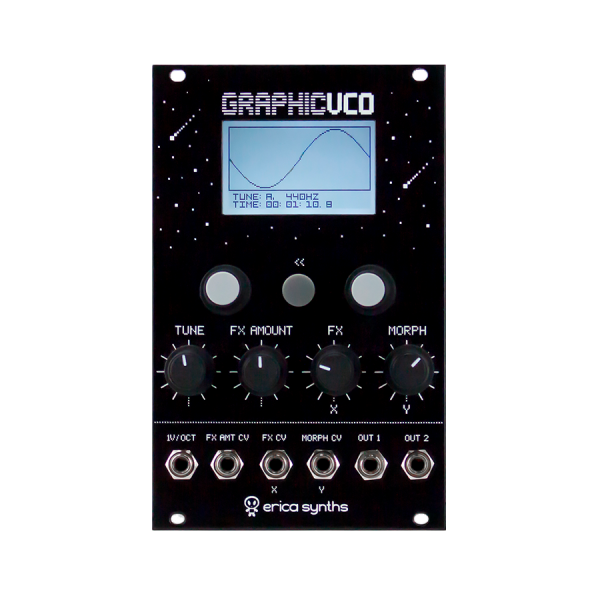 To have the module functionality up to date, we recommend you time by time check announcements about firmware updates for the Graphic VCO on www.ericasynths.lv or on our social media. You can update the firmware of the module via miniUSB cable. More detailed instructions of the firmware update can be found in User Manual. A passive 1-into-5 multiple in a star shape - very simple, very practical.